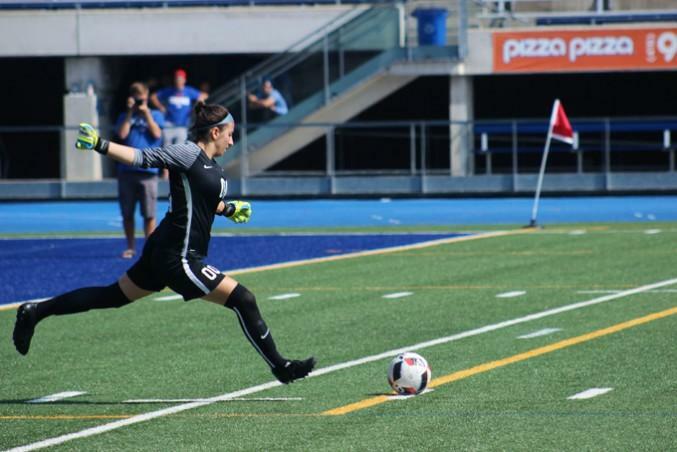 Close calls and near misses were the theme at Varsity Stadium on Sunday afternoon, as Ryerson’s women’s soccer team played to a scoreless draw against the University of Toronto Varsity Blues. Ryerson scored twice in the match, but both goals were nullified by offside calls. The Rams thought they had the go-ahead goal after Alessia Carvalho scored from less than five feet out in the 37th minute, but the play was called back. The Rams were denied again in the 67th minute when they successfully converted on a cross only to have the goal disallowed. The Varsity Blues had their best chances of the match towards the end of the second half. Less than two minutes after the Rams had their second goal called back, U of T’s Alexandra Rocha hit the post with Rams keeper Elisa Lapadula out of position. Toronto nearly pulled ahead in the 83rd minute, but Natasha Klasios rang her shot off the crossbar to keep the game scoreless. With the draw, both teams now have identical 2-4-1 records. Ryerson snapped a two-game losing streak, but haven’t won since beating Trent 4-1 on Sept. 4. The Rams haven’t scored a goal since that victory. In men’s action, Raheem Rose scored his fifth goal of the season in the 35th minute to lift Ryerson to a 1-0 win over their crosstown rivals. Ryerson came into the game as the fourth-ranked team in Canada and improves to 6-0 on the year. U of T, the eighth-ranked team in the country, fell to 3-1-2 with their first loss of the campaign.